Crafting for all Seasons is starting Ch#5 - Furry Friends. I can't believe we are now at challenge number 5! Wow, we are really enjoying seeing your projects each challenge! Thank you for joining in on the fun! This challenge is sponsored by Di's Digi Downloads. Head over to Crafting for all Seasons and add your project today! 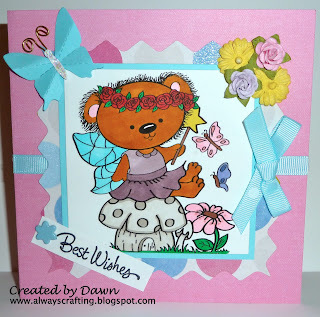 Really cute card, thanks for joining us at Cardmadfairy's digi days Challenge. Really cute card, love the colors and I would like to Thank you for joining us at Scrapalicious USA's Bear Challenge, good luck and I hope to see you at many more! Oh my goodness Dawn this is so super sweet. I LOVE that image and that is some great colorng!! !